Liverpool-born, Oxford-educated, on stage from 1911, Leslie Banks entered films in Hollywood in the famous horror piece, The Most Dangerous Game (US, d. Ernest B.Schoedsack, 1932, aka The Hounds of Zaroff), returned to Britain for Strange Evidence (d. Robert Milton, 1933) and became an important character star. A facially-paralysing injury in World War I left him without the leading man's conventional handsomeness, but did not preclude interesting roles. 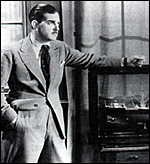 He starred for Hitchcock in The Man Who Knew Too Much (1934) and Jamaica Inn (1939), Michael Powell in The Fire Raisers (1933), Red Ensign and The Night of the Party (1934), Zoltan Korda in Sanders of the River (1935), bearing the white man's burden in Africa, and Thorold Dickinson in The Arsenal Stadium Mystery (1939). His civilised, rugged persona was cleverly exploited in Went the Day Well? (d. Alberto Cavalcanti, 1942) as the treacherous squire; he was a memorably inviting Chorus in Olivier 's Henry V (1944); and in his last film, Madeleine (d. David Lean, 1949), he was Ann Todd 's oppressive Victorian father. He was awarded the CBE in 1950.